SJ Bradley’s second novel, Guest, published by Dead Ink is out now. You can read an excerpt from it here. Guest will be launched on Thursday 27 July at Waterstones, Leeds. This is a free event but please register your attendance here. Samhain waited in the dark hallway, restless. Carrying a rucksack of things that might have looked, to anybody else, like the tools a person might use to break into a place. “No – no – no – no – no…” Frankie, bent as a folded card, sorted through hasps and screws. Gorilla’s palms: hands that gripped drum sticks, and shifted guitar cabs. Fingers that fixed, cooked, nursed. Rattling now with loose lock mechanisms, and keys that didn’t fit. “You know what this reminds me of?” Samhain said. They’d got in through a window at the back, and whoever had been in this grand hallway last had boarded over the top glass. It may be midsummer outside, but it was night here. If Frankie would only step out into the day a moment, he could find what he needed right away. But Frankie never wanted to open the door to the outside. Not until they were standing with lock and key and screws laying out ready, to secure the squat. A superstition that had grown from Frankie once having been thrown out of a place, only ten minutes after breaking it. Crinkled envelope eyes: a smile with one molar missing. That was the smile. The one that had seen Samhain through hangover after hangover: the smile that, seen first time, had started the longest friendship of his life. Eighteen, young and stumbling, with head throbbing and the gig room rolling around him like a head of lettuce in a salad spinner, Samhain had looked into that face and taken Frankie for somebody he already knew. He’d thought Frankie was the same man who’d lent him a balaclava and scarf in Genoa. Firm hands had dragged Samhain up from the sticky social floor, and he’d started saying, “I love you,” before he’d even made it to his feet. “Steady on,” Frankie had said. On their second, more sober, encounter, Samhain had realized his mistake. But those first few words had been the start of something. And now here they were. Samhain started hitting, working away at the bolts. Blows exploded along the door. Across the floor: he felt every hammer-fall in his shoes. Two sets of hands, working away. Hauling at it, pulling a truck’s weight, until at last the door came open. Just a nick at first: enough for a golden hair of light to run down the right-hand wall. “Nothing’s ever simple, is it?” Samhain could already feel the beginnings of a morning-after ache in his chest and shoulders. His belt chafed with salt sweat. This was a solid door, a thing built to keep intruders away. One last wrench, and it came swinging like a backhanded tennis racquet. Sunlight. Liquid amber on wall and into eyes. Samhain blinked: he was looking out into a tangled bower of blooming pink roses, and white trumpets of bindweed. Leaves brighter than new peas. Twigs and stalks twisting in an arch, branches and boughs in a person-sized nest. And there in its centre, wearing slacks and a golf sweater, stood a bald and cheerily-smiling man. 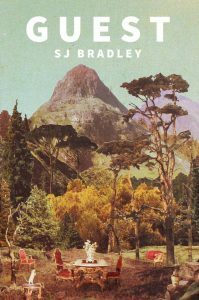 Join Leeds author SJ Bradley for the launch of her second novel, Guest, published by Dead Ink Books, at Waterstones Leeds, 6.30pm on Thursday 27 July. Sarah will read from and discuss her book before taking audience questions and signing copies of the novel. 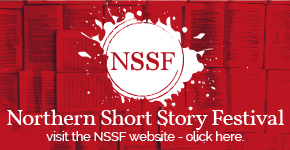 SJ Bradley is an award winning short story writer, recent winner of a Saboteur Award for her work editing the Remembering Oluwale anthology, novelist of Brick Mother and founder of Leeds based Fictions of Every Kind. Tickets are free but places must be reserved in advance. To reserve your place please email leeds@waterstones.com, ring 0113 244 4588 or tweet @WStonesLeeds. More information here.